Looking for a venue close to home? Check out these clever backyard wedding ideas! Every bride is sure to have a budget in mind for her big day. When calculating all the costs for a venue, flowers, etc. the price can be staggering. Why spend all your money on this when there is a simple solution to cutting down all these costs? A backyard wedding not only helps you reprioritize your budget but it gives your special day an at home feel. Backyard weddings can be just as beautiful and romantic as having your wedding at a catering hall, country club, or whatever other venue you would choose. You can save a large chunk of money without sparing the details. Backyard weddings give you the opportunity to turn your own home into your own fairytale. Every girl plays princess in their backyard when they are little, having your wedding there makes this a reality. Using a few simple DIY techniques, your backyard can become an amazing venue for your special day. Not only is it cost effective, but also it allows you to bring your closest family and friends into your home for the most special day of your life. Backyard weddings take a lot of work, but they are well worth the effort. Most of it is DIY work, things that you can make personal and create yourself. This allows you to make your wedding really meaningful and gives you the chance to create the wedding you always imagined. Using a few of these ideas, you can make sure your backyard wedding will be magical! Rustic: Having an at home wedding gives you the opportunity to have a do something really creative. Having a rustic theme to your wedding really give you the chance to take advantage of being at home. This type of theme really plays up the fact that you are in a home. The best place to find little decorations for your day would be at an antique or a thrift store. Having things that look old gives a romantic vibe as well a making your wedding seem personal and intimate. For your guestbook find an old antique box and put little pieces of cardstock in for people to write on. For place cards hang rope between two trees or plants and clip on the cards using clothing pins. Taking flowers and putting them in decorative jars can make beautifully simple centerpieces. Line the aisle with potted flowers for a lovely walkway down to the groom! Lighting: If you are planning an evening wedding, lighting is going to be an important factor to your day. The obvious way to do lights is to take your Christmas lights and hang them all around the yard. There are much more creative ways to give your wedding night the right light. Having a lot of trees in your backyard makes for the best lighting situation. Using what is called the string of stars can create a magical look. Using single strings of twinkling lights creates a starry sky beneath the trees. Put lights low over the tables to create a very intimate setting. Using simple bistro lights over the table area and the dance floor gives a lovely canopy effect. 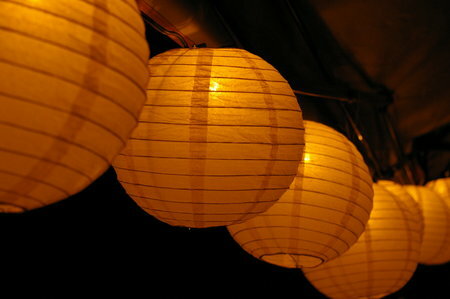 Paper lanterns and bags holding lit candles give a romantic aura over the whole wedding. Lastly, if you’re looking to be extra creative, you can make your own lights. Put a water balloon with a glow stick on the inside in a stocking and hang from trees for a truly unique look! The Aisle: Having an outdoor wedding gives a lot of room to be creative with making your own aisle. While you probably will not have a hardwood aisle of any form there are many ways to accentuate the path that you will be walking down. The most traditional way would be with flowers. You can take pots of flowers to line the aisle with and top it off with flower pedals down the center of the aisle. If you’re having a fall wedding, you can line the aisle with colored leaves, pumpkins and what ever other gourds you would like to put down there. You can even do something as simple as taking branches to line the aisle to give it a true outdoorsy look. During the summer you can line the aisle with matching or non-matching parasols or colorful pinwheels. The options for making your own aisle are endless. Subject: LongIsland.com - Your Name sent you Article details of "Have Your Wedding In Your Own Backyard!"